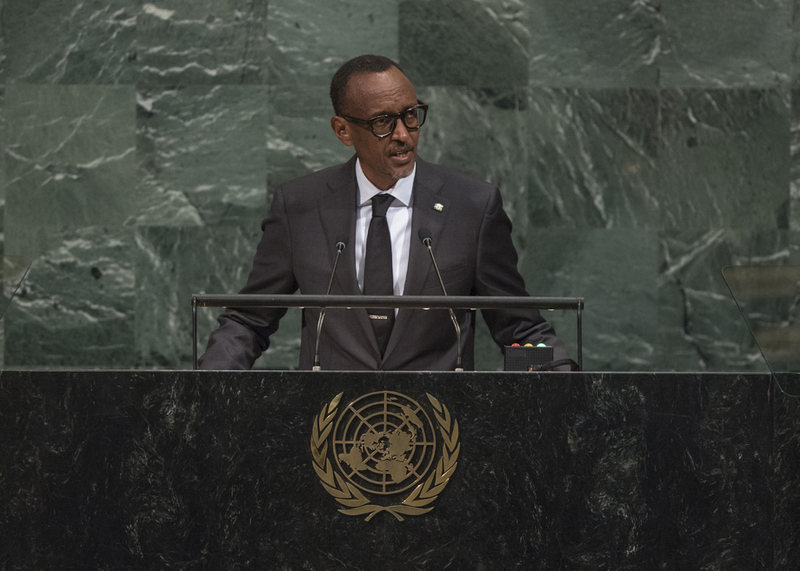 PAUL KAGAME, President of Rwanda, described the relevance of the United Nations in setting the global agenda on key policy issues, from development to women’s rights and the role it played in humanitarian assistance. However, there was a sense that the United Nations had not yet met many needs and expectations. He commended the Secretary General for championing the important initiatives of United Nations reform, and the response to sexual exploitation and abuse. Those steps were at the heart of the issues facing the international system, tackling the deficit of trust and accountability. To enable a decent life for all, the Organization must treat all people with impartiality and respect, and steward well the funds entrusted to it. The tools and mandates to address such challenges as climate change, peacebuilding, human equality and development were available, he explained, but what lacked were concrete actions to “get things done”. Institutional reform was not a one-off event; its essence was a mindset of constant striving to improve performance and delivery, as well as accountability for shortcomings and results. Encouraged by the reform spirit that was taking root in the United Nations and the African Union alike, he said Rwanda was pleased to be associated with both, as such efforts would position those entities to work closely together. He drew attention to steps that could be taken on both sides to improve the quality of coordination and consultation. The African Union and the United Nations were already good partners in peacekeeping, and Rwanda was proud to have forces serving under both flags, he said. Rwanda shared the common objective of meeting the Sustainable Development Goals and Africa’s Agenda 2063, and was working to enhance women’s empowerment. He said that together with Canada and other stakeholders, Rwanda was raising awareness of the impact women could have on the ratification and implementation of the Kigali Amendment to the Montreal Protocol. That instrument was among the most important actions a country could take to tackle climate change and reaffirm commitment to the Paris Agreement. Fewer than 15 ratifications were needed for the Amendment to come into force in 2019. Indeed, the world faced serious challenges, but working together in a constructive spirit could enable a bright future for the generations to come, he concluded.